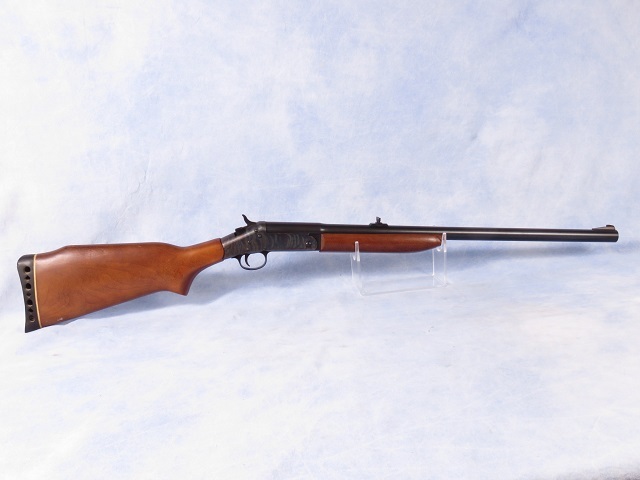 Harrington & Richardson model 162 single shot break-open shotgun chambered in 12 gauge. This is a hard to find smoothbore break-open shotgun with rifle (open) sights. No longer in production by Remington/New England Firearms/H&R, the brand is a high quality single shot - great for starting shooters. Bluing and casehardened finishes are in great shape with just some very fine surface speckling. The hardwood furniture has a couple slight handling marks, and a really nice finish. Bore is bright and shiny. Choke is Cylinder, for throwing the less expensive rifled slugs. Great find, don't miss it!